mTrip nominated for Augmented Planet 2010 Readers Choice Awards! This week Augmented Planet nominated mTrip for the 2010 Augmented Planet Readers Choice Awards. They teamed up with Samsung this year for their prizing, which means you can win a Samsung phone if you vote. 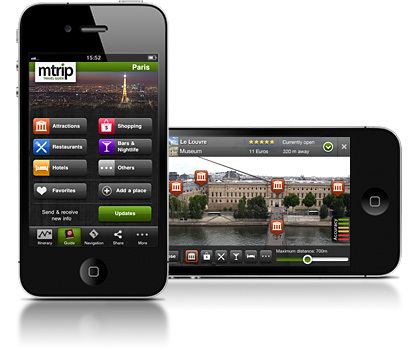 mTrip offers augmented reality on its travel guide application, available across Europe and North America. Users can view their environment in mixed reality to get a better sense of the places around them. The augmented reality tool provides users with helpful information on attractions, museums, hotels, restaurants, bars, etc…Icons of the points of interest are overlaid onto ones phone, with helpful travel information, such as opening hours, traveler ratings and distances. This is all done from the users smartphone. Readers can go online and vote for their favorite Augmented Reality application. Show your support & Vote for mTrip!